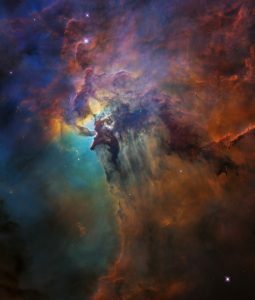 In honor of its 28th birthday, NASA’s Hubble Space Telescope has beamed down two different images of the incredible Lagoon Nebula. Even after 163,000 orbits around the planet and over a million photos, the Hubble never fails to impress. The images are a reminder of just how much insight the instrument has given us since it was first launched on April 24, 1990. Picture of the Lagoon Nebula provided by NASA. The star of the images is Herschel 36 which beams brightly at the center of the photos. Just 1 million years old—a baby by star standards—it’s 200,000 time brighter and 32 times larger than the Sun. Located 4,000 light years away, the Lagoon Nebula appears as a speck in the sky when looking through binoculars, but thanks to the Hubble we can see it in its full glory. The Hubble Space Telescope will continue to churn out images—and advent calendars—for the foreseeable future. Though its successor, the James Webb Space Telescope, is set to launch in 2020, it’s estimated that the Hubble will continue its mission until it re-enters our atmosphere at some point during the 2030s. For now, it will continue to rack up frequent flyer miles, adding to the 4 billion already traveled. Watch as the Hubble zooms in on the Lagoon Nebula.